Well, now, seein' as how I had to schlep you off to detox with Mugsy at the last #pawpawty, your papa might have a point... Just barkin'. My drinking habits made me sick too!! But my problem is I drink from nasty puddles with delicious bacteria in them. But with all the rain this summer, how's a boy to resist?! 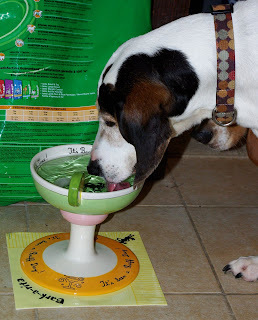 Oh that is absolutely hysterical, drinking from the Barkarita glass! !